It’s been a chilly, rainy start to fall so far–and what better way to warm up than with a cozy bowl of Butternut Squash Apple Soup? I haven’t had butternut squash in over a year thanks to the Butternut Squash Mac & Cheese overdose of winter 2009, but a large butternut squash at the Farmer’s Market looked so yummy that I just had to bring it home. 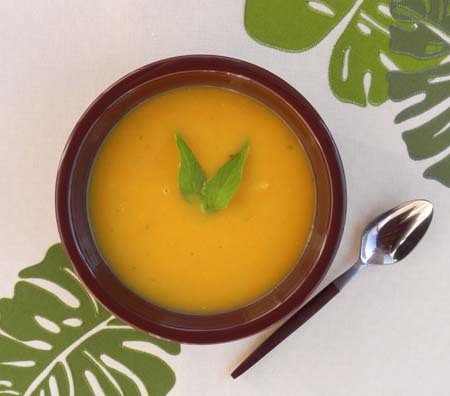 I loved the sweet-tart flavor of this soup, intensified by roasting the squash and slowly cooking a plethora of other produce including pieces of onions, carrots, celery, and apples. Some spices top off the delightfulness of this creamy soup. For a little extra treat, try stirring in some sour cream for a cool twist on this hot dish! Reader Question ~ What’s your favorite fall soup? Preheat oven to 400 degrees. Cut butternut squash in half lengthwise, then scoop out seeds and membranes. Place flesh side up on a large baking sheet, then roast for 25 minutes or until tender. Let cool for a few minutes and then scoop out squash and place in a bowl. Meanwhile, melt butter in a large saucepan over medium-high heat. Then add onion, celery, and carrot to the pot and saute for 5 minutes. Vegetables should begin to soften but not brown. Next, add squash, apple, chicken broth, and water. Cover and simmer for 30 minutes or until softened. Puree with an immersion blender and return to the pot. Add spices to taste and serve with warm bread. Time: 70 minutes [15 minutes active]. My Mom used to make a wicked-delicious butternut squash soup. I’m getting the urge to try your recipe, I think because it brings back happy childhood memories (well, more like teenagehood memories =).